The name of thirteen different persons mentioned in the Bible. As vocalized in the Masoretic text, it means "worshiper of Yhwh." 1. Head steward to King Ahab of Israel. At the time of the persecution of the prophets of Yhwh by Jezebel, Obadiah succeeded in concealing one hundred of them in caves (I Kings xviii. 4-6). During the great famine he was sent by Ahab to search for food. He met the prophet Elijah, and brought Ahab the message that the famine was at an end (ib. 6 et seq.). 2. A descendant of Jeduthun (I Chron. ix. 16). 3. One of the grandchildren of the last king, Jeconiah (ib. iii. 21). 4. A descendant of the tribe of Issachar, and one of David's heroes (ib. vii. 3). 5. A descendant of Saul (ib. viii. 38, ix. 44). 6. A Gadite, the second in the list of David's heroes who joined him in the desert before the capture of Ziklag (ib. xii. 9). 7. Father of Ishmaiah, who was appointed representative of the tribe of Zebulun, under David (ib. xxvii. 19). 8. One of the officers sent by Jehoshaphat to teach in the different towns of Judea (II Chron. xvii. 7). 9. A Levite, who, during the reign of Josiah, was placed over the workmen repairing the Temple (ib. xxxiv. 12). 10. Son of Jehiel; chief of 218 men who returned with Ezra to Palestine (Ezra viii. 9). 11. One of those who signed, with Nehemiah, the covenant to live according to the doctrines of the law of Moses (Neh. x. 6). 12. One of the porters of the gates in the porticoes of the new Temple (ib. xii. 25). 13. A prophet who lived probably about 587 B.C. (Ob. 1). 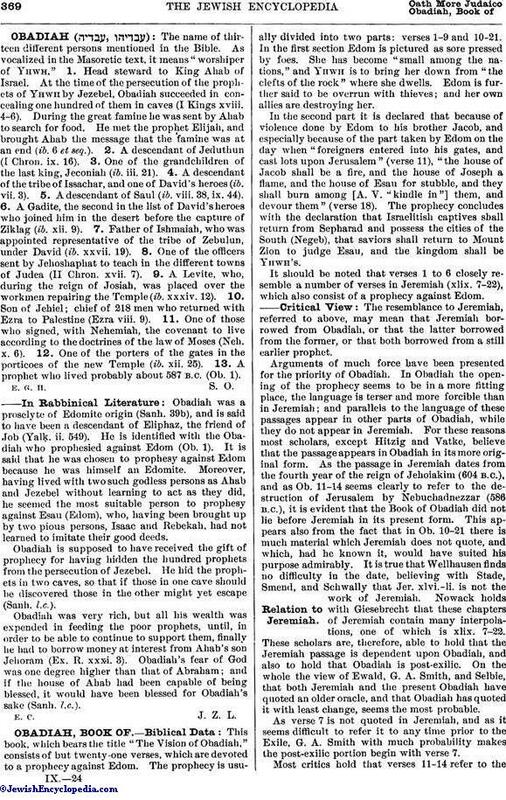 Obadiah was a proselyte of Edomite origin (Sanh. 39b), and is said to have been a descendant of Eliphaz, the friend of Job (Yalḳ. ii. 549). He is identified with the Obadiah who prophesied against Edom (Ob. 1). It is said that he was chosen to prophesy against Edom because he was himself an Edomite. Moreover, having lived with two such godless persons as Ahab and Jezebel without learning to act as they did, he seemed the most suitable person to prophesy against Esau (Edom), who, having been brought up by two pious persons, Isaac and Rebekah, had not learned to imitate their good deeds. Obadiah is supposed to have received the gift of prophecy for having hidden the hundred prophets from the persecution of Jezebel. He hid the prophets in two caves, so that if those in one cave should be discovered those in the other might yet escape (Sanh. l.c.). Obadiah was very rich, but all his wealth was expended in feeding the poor prophets, until, in order to be able to continue to support them, finally he had to borrow money at interest from Ahab's son Jehoram (Ex. R. xxxi. 3). Obadiah's fear of God was one degree higher than that of Abraham; and if the house of Ahab had been capable of being blessed, it would have been blessed for Obadiah's sake (Sanh. l.c. ).